Based on the longstanding experience of Prof. Mayer’s group in APTAMER development and application, specifically in generating chemically modified APTAMERs to be used as capturing reagents (as well known for antibody-antigen interactions) we seek to identify suitable APTAMERs recognizing specific T-cell markers predictive for kidney transplant rejection. The group of Prof. Blume has extended knowledge in the field of kidney transplantation and transplant rejection issues as well as in assay development like ELONA assays for point-of-care (POC) diagnostics, which will help to develop a robust and sensitive POC test for the intended early detection of kidney rejection problems as early as possible in transplanted patients. 27.02.19 – The registration for our workshop 2019 is open – we are looking forward for your emails! To the registration. 02.01.18 – Today, Tjaša Legen starts as a new PhD student in our lab. We wish her all the best for her start. 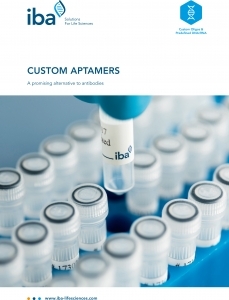 27.02.19 – We are looking forward to meet you at the conference “Aptamers 2019 OXFORD“ 3rd- 4th April in Oxford, UK. 01.08.18 – We will be present at the conference “Aptamers in Boulder“ 3rd- 4th August in Boulder, USA. 22.03.18 – We will be present at the conference “Aptamers 2018 OXFORD“ 11th- 12th April in Oxford, UK. Feel free to contact us. 05.03.18 – Our team will be attending the International Symposium for Nano-Biotechnology, Chemical & Medical Biology and Robotics. We look forward to seeing you! 01.09.17 – Members of CARD will be present at the conference in Bordeaux 22nd to 23rd of September. Feel free to contact us.